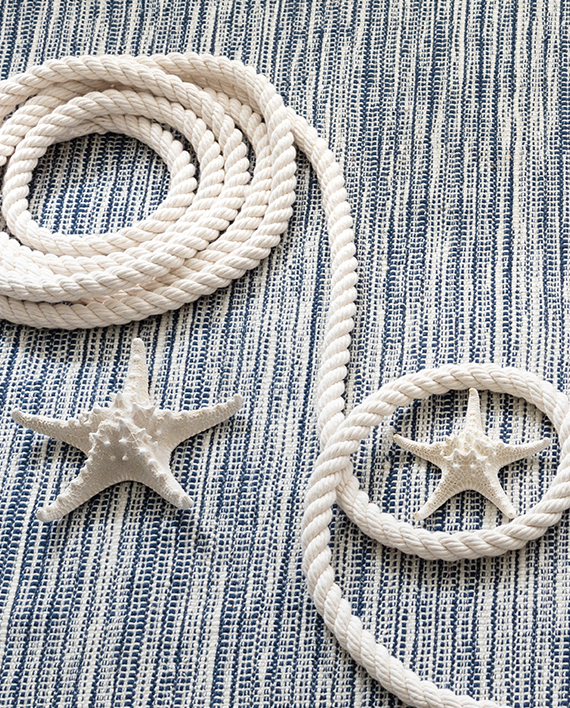 Navy and white threads with a blanket stitch-like overlay evoke the incoming tidal waters as they dash and crash to the beach, emulating the manes of white horses streaming in the breeze. Styled for ship or shore, and open-air living. Handloomed in resilient performance threads as beautiful as they are durable, fade resistant, scrubbable and still have a soft hand like cotton. 100% P.E.T. a recycled polyester. UV-stabilized to resist fading. P.E.T. is an abbreviation for polyethylene terephthalate. 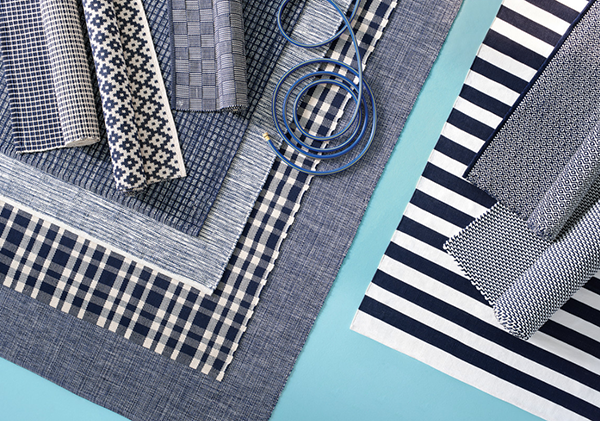 It is a non-chemically-treated, recycled polyester that’s as earth-friendly as it is gorgeous. Vaccum, lightly brush with fresh or soapy water, or spray with a hose. Do not machine wash. Do not machine dry. No dry cleaning. Due to handmade quality of our rugs, they may vary slightly in size and/or color. 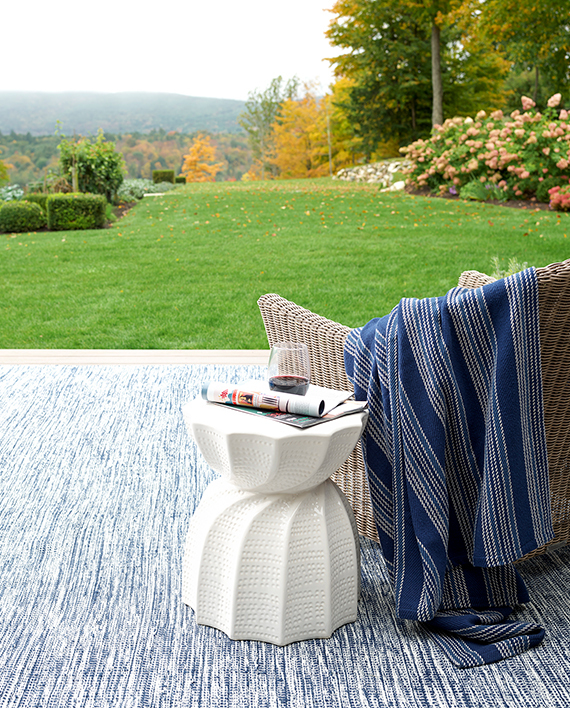 Part of our Bunny Williams collection, this delicately striped, navy indoor/outdoor rug was inspired by an antique rug sample from the designer's own personal collection. Due to the handmade nature of this area rug, variations in color are expected. Featured image shows a 2' x 3' size. We’ve added new texture and optical dimension to our flatweave indoor/outdoor rug construction with this ridgey horizontal/vertical basketweave stripe. Update traditional spaces with this versatile and durable indoor/outdoor rug. 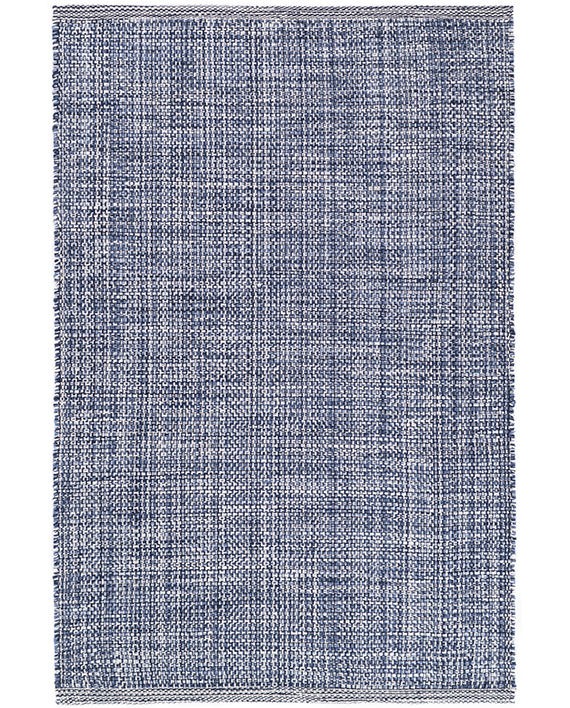 Featuring a navy and ivory herringbone pattern, this area rug lends a subtle touch of contemporary pattern to high-traffic rooms throughout the home. Pump up the performance volume with this winning combo of beauty, brawn, and brains. Tricolor multi-marl, multi-thread low profile flat woven “no pattern” polypropylene rug holds all the aces as the perfect heather hued base for any high traffic area. Offering subtle interest for the eye in two color options, and it’s a cinch to keep clean in homes with pets and kids. 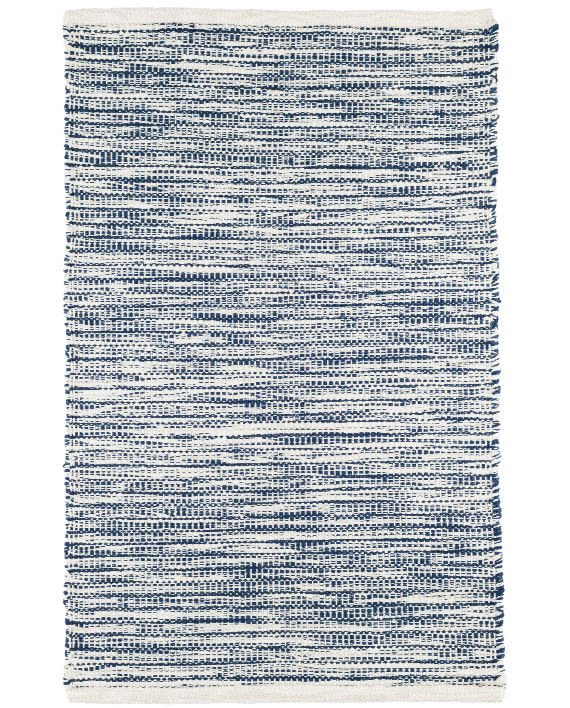 Featuring a delicate diamond pattern in a classic navy-and-ivory combo, this eco-friendly indoor/outdoor rug adds just a touch of graphic flair to rooms throughout the home.